The CCWA may accept donations of artworks to the collection through the Ministry of the Arts Cultural Gifts Program, provided they fit within acquisition parameters. The Cruthers Collection of Women’s Art (CCWA) at The University of Western Australia is Australia’s largest specialist collection of women’s art. A dynamic program of exhibitions drawing from the CCWA can be viewed year-round in the Lady Sheila Cruthers Gallery, a dedicated space within the Lawrence Wilson Art Gallery. Lady Sheila Cruthers took an immediate shine to women’s self-portraiture when she began collecting art in the mid-1970s. This interest expanded into a collection strategy she referred to as ‘the artist and her work’ – Lady Cruthers would collect an artist’s work in addition to a self-portrait, with the two works often hung side by side in the family home. 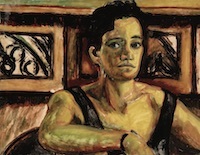 Now housed at the University of Western Australia, the Cruthers Collection of Women’s Art holds over 100 self-portraits, many collected as a result of this strategy. The Artist and Her Work utilises this unusual juxtaposition to showcase the breadth and depth of women’s art practice, replicating the dense and vibrant hanging style of the collection’s original domestic context. Pairs of works will be exchanged throughout the exhibition period to create a dynamic collection showcase that will reward repeated viewing. The Cruthers Collection of Women's Art (CCWA) is founded upon a substantial gift made by Sir James and Lady Sheila Cruthers to the University of Western Australia in 2007. Lady Sheila Cruthers and her son John began building a collection of women’s art in the 1970s, focusing primarily on portraiture and self-portraiture and as well as key areas such as modernism, post-modernism, feminism and abstraction. Decades of passionate advocacy and support for the art of Australian women have resulted in a diverse, eclectic and distinct collection and a significant contribution to the history of Australian art. The CCWA includes works from the 1890s to present day in a variety of media. It features well-known historical figures and prominent contemporary artists as well as a host of significant, yet under-recognised practices. A substantial survey exhibition, LOOK LOOK AGAIN, was presented at Lawrence Wilson Art Gallery in 2012. A full-colour companion publication, Into the Light, explores the collection in detail. The CCWA continues to expand through focused acquisition. It aims to contribute to and challenge dialogues about Australian women’s art through exhibition, teaching, research and publication. 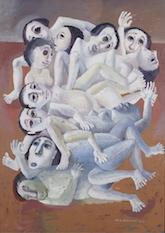 Erica McGilchrist, The Abandoned (Kew Mental Hospital), 1954, oil on board, 92 x 69cm. CCWA 974. Cruthers Collection of Women's Art, The University of Western Australia. Donated through the Australian Government’s Cultural Gifts Program by Phillip Boulten. (c) Courtesy the artist's estate. The Abandoned (Kew Mental Hospital) is one of an important series of paintings and drawings produced during McGilchrist’s 18 month period as an art instructor at the Kew Mental Hospital. The Cruthers Collection of Women's Art is generously supported by SHEILA A foundation for women in visual art.